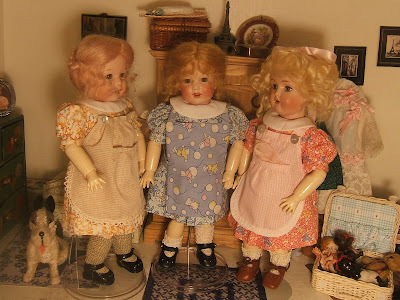 Looking through one of my favorite books on Bleuette, "bleuette, la petitefille modele de la collection, Billyboy*", I found pictures of an apron, or Tablier. 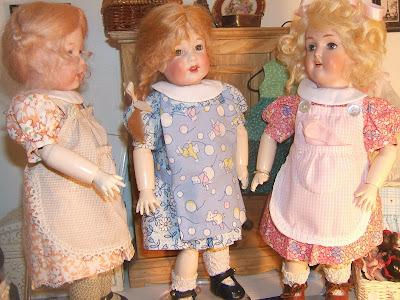 My E-Pattern "Fennasion" or Schooldresses for Bleuette is made for the years 40-60. (This pattern is also modeled after pictures from this book). I needed an apron (Tablier) that could be worn with the school dresses that I love for my Bleuettes. The picture below shows one apron as from the early 50's. All my patterns are now on eBay, Simply Grace Designs. Billyboy* states in his book, " Park with the Taches", of spring - summer 1952. carries over a printed dress of 1946." I tried to match this sweet apron with a pattern. 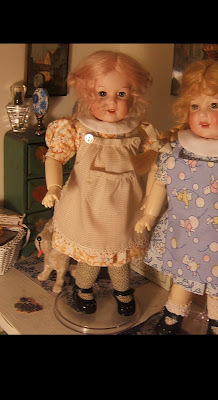 My bleuette Ann and Daisy, wear my interpretation of this apron. The apron is crisscrossed in the back and has two large mother of pearl buttons as closure. Daisy has a little hanky in her pocket. 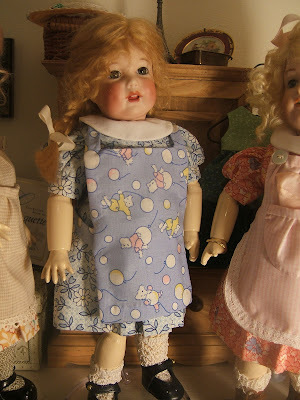 I kept the aprons plain, with just a tad of cotton lace in keeping with the look of Bleuette. The blue apron below is from Bleuette's World Winter 2005/2006 Volume 7, Number 4. It is Tablier Fantasie - Fantasy Apron for LSDS Number 38, 1926. If I made this apron again, I would close in the neck some and not make the shoulders so far apart. As with all LSDS patterns, I try and make a mock up, and then use my fashion fabrics. This one I made up without a mock up. It is still cute with the 30 type fabric. Anna is wearing the apron from Billyboy*s book in an Imperial Broadcloth micro check in tan. I used a cotton lace to trim the apron and large mother of pearl buttons. 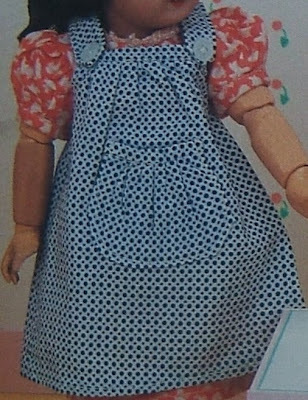 Daisy's apron is a pink and white pima cotton lawn with white trim. I will have this pattern as a free E-Pattern sometime soon. It is very simple to put together. 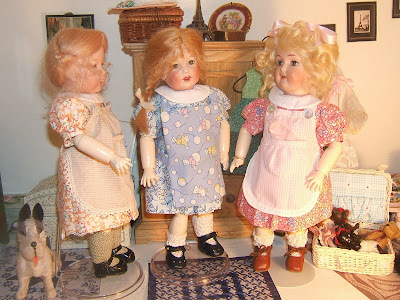 My three aprons are all handsewn, since my dolls are wearing all their proper underclothing plus the dress and apron.